4/04/03: Arrrr! There be screencaps here! See the trailer clip here, and don't forget the 2-1/2 minute version on ABC Sunday night! created 2/22/03--updated 4/04/03: Trailer screencaps! 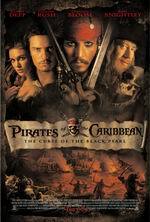 Premise: Johnny Depp and Orlando Bloom play pirates. Really, do you care if there's a plot? Why we care: Ladies, I think you hear what I'm sayin' on this one. on Pirates of the Caribbean and other movies great and small.